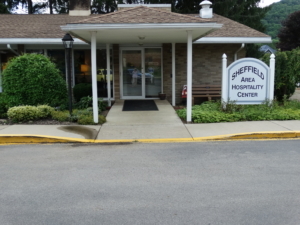 Sheffield Senior Center - Experience, Inc. Experience, Inc., your local Agency Area on Aging (AAA), sponsors Warren and Forest Senior Community Centers, which offer a variety of programs and services to help senior citizens maintain their independence, vitality, and provide a place for seniors to have the opportunity to meet other seniors through social interaction. Programs include activities, educational classes, counseling and support groups, volunteer opportunities, and wellness programs. Warren and Forest County Senior Centers also offer meals, help with financial and medical paperwork, transportation to and from the center, shopping trips, outings, and other social services. Experience, Inc. sponsors and partners with TAWC of Warren County 723-1875 and Forest County Transportation 814-927-8266 to provide reduced rates to individuals age 65+ at a reduced rate of .75 per trip in Warren County and a maximum of $3.80 outside of the Counties. If you wish to order a lunch call the Sheffield Hospitality Center at 968-5667. Please call two business days in advance.